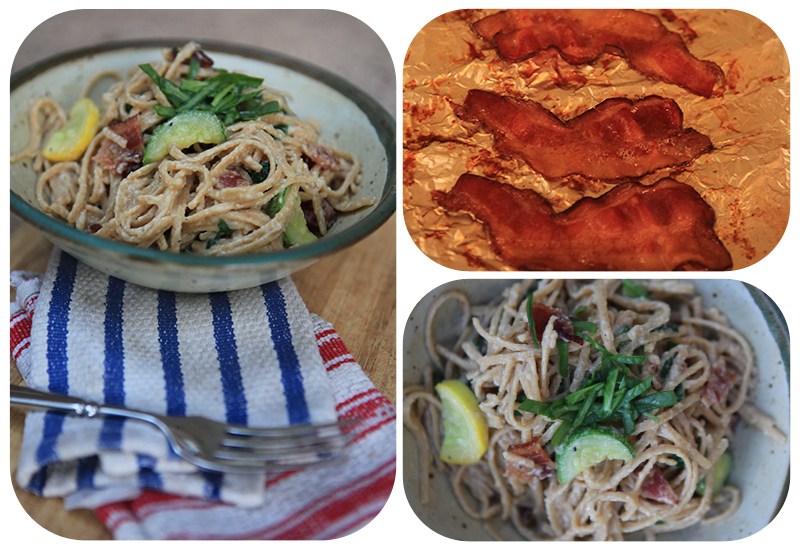 My kids’ very favorite dinner is Pasta Carbonara, a creamy pasta with bacon. They have called it “special pasta” for as long as I can remember. Somehow we tricked them at an early age to into thinking that this very simple pasta dish is actually a fancy delicacy. It is repeatedly requested for birthday dinners and celebration meals. And we always make it at least once on a long camping trip. I used thin sliced Petit Jean bacon and I have recently come into the the joy of cooking bacon in the oven. Seriously, it makes life so much easier. I can’t believe I haven’t been doing it for years! Line a cookie sheet with parchment and bacon, cook for 15 minutes at 350 degrees F for evenly cooked bacon and no grease splatters on your shirts and aprons. Yay! Optional: 1 small zucchini and 1 small yellow squash, sliced and sauteed in 1 tablespoon olive oil for about 3 minutes. You can also substitute sauteed mushrooms here. Add bacon, cheese, parsley and squash (if using); toss to mix. Bacon for Creamy Pasta with Bacon was provided by Petit Jean Meats, a local Arkansas company. I am a member of their Blue Diamond Club, which basically means they send me products which I select and then share with you. Subscribe to the Chino House via email (box on the top right of web page) so you won’t miss the chance to win a Petit Jean Thanksgiving Ham, coming soon! I was looking for your Carbonara recipe just the other day! Couldn’t find it and had to settle for a lesser version…I’m so so happy you posted this.